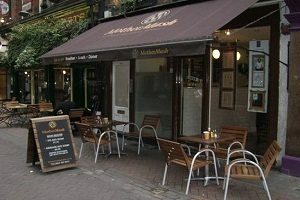 Do you manage a restaurant near London Palladium? Click here to contact us and get listed. We have had the pleasure of experiencing the Soho Oyster House first hand and it is an absolute treat for fish lovers! 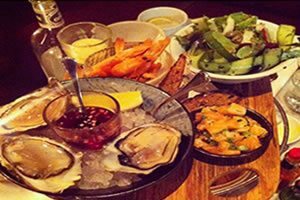 Along with many speciality oysters on offer, The Wright Brothers has an extensive A la Carte menu including some seriously mouth-watering dishes such as a whole black pepper crab, mussels in Penang curry sauce and a selection of sake platters. We recommend the “surfboards” for pre-theatre diners; these are a selection of boards with a fish focus, plus an appetising vegetarian board. We tried the tempura king prawn & cod and the Jersey oysters, salmon ceviche and Atlantic prawn boards which were both affordable and delightful! The restaurant serves a selection of delicious desserts which are perfect for those with a bit more time on their hands before the theatre. On top of that, the Wright Brothers has a great selection of wine and cocktails. Call 020 7324 7731 for reservations and further information. During a trip to London, what could be better than some hearty traditional British grub? Pie and mash and sausage and mash have always been much celebrated dishes in England and good old fashioned pie shops have been littering the London streets for centuries. MotherMash is a simple modern take on a tasty tradition with diners being able to choose a type of mash (yes there are at least five different options!) a main (sausage or pie) and their own type of gravy. Of course there is also a tasty array of side dishes and to complete the mash experience. Call 020 7494 9644 for reservations and further information.